Despite recent advances in 3D technology home computers still use a strict 2D UI, why is this? Probably because 3D hurts some peoples yes and there just isnt any reason for a 3D desktop. However these scientists thought different because they have created the first 3D desktop environment, and i must say it looks pretty cool! Users can casually open up the See-Through 3D Desktop and Type on the keyboard or use a trackpad as in traditional 2D operating environment. Windows or files are perceived to be placed in a 3D space between a screen and the input plane. The user can lift up his hands to reach the displayed windows and arrange them in this 3D space. A unique combination of a transparent display and 3D gesture detection algorithm collocates input space and 3D rendering without tethering or encumbering users with wearable devices. 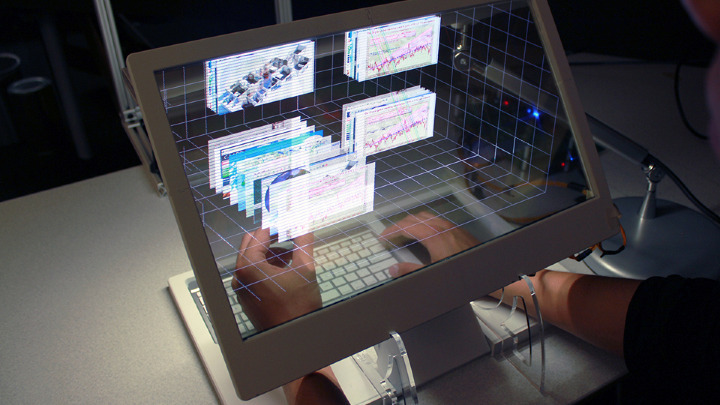 See-through 3D desktop is a term for the entire ensemble of necessary software hardware and design technological components for realizing this volumetric operating environment. Previous: Apparently airplane technicians have a sense of humor too! Next: How to opt out of Googles "illegal" tracking of your web history!